I want my Nanny: Friday FAQ –If I already have a nanny, what happens with changes to the LCP? Friday FAQ –If I already have a nanny, what happens with changes to the LCP? "Does this affect me if I have a nanny already?" More importantly, you’re wondering if we now have to pay health insurance and workplace safety insurance? All and any of the recent changes only affect you if you are applying for a Labour Market Opinion after April 1, 2010. If you already have a live-in caregiver, you would (should?!) already have an approved LMO, and would have filled that LMO by hiring your nanny. 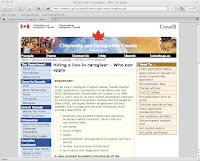 If you have filled the position prior to the LMO expiring, with a employee who has a valid work permit and employment contract, you are not affected by these changes and do not need to change anything in your existing care-giver employment situation, including paying for health insurance fees (if they apply in your province) and workplace safety insurance. That being said, you should make sure both of the other two other parts of your live in caregiver arrangement 1) a work permit and 2) an employment contract are still valid. If your nanny’s work permit is about to expire, they will need to apply to extend it. Also note that after a live-in caregiver has worked under the Program for two years within three years of their date of entry into Canada, they can apply for permanent residence. They may also wish to apply for an open work permit, which would allow them to work in Canada in any occupation. A Sample employment contract can be found here. And, while we aren't obligated to pay workplace safety insurance, I think its a good idea. If you have any sort of good relationship with your nanny, you would want to make sure they were supported if they were injured on the job, unable to work etc. Like a traditional employer it may be worth providing, or co-paying. Anyway, looks like today, for those of us with nannies in place, there is nothing to worry about for April 1st. Now, if these changes result in the cost of bringing in a foreign worker prohibitive, and we start seeing the kind of ‘nanny-poaching’ that has been seen in some other communities, it will be another story. Share your concerns, comments regarding these changes and any impact you see as they roll out and I'll be sure to post them here for everyone.